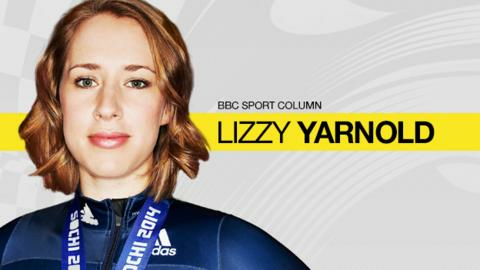 Lizzy Yarnold won a skeleton gold medal at the 2014 Winter Olympics in Sochi and races for the first time in the new season in the World Cup at Lake Placid, USA, on Friday. However, in an exclusive column for BBC Sport, she reveals that not everything has gone to plan in pre-season. The season after an Olympic Games can be challenging for athletes, we all have to check in with our motivation - for me I have to know what is going to get me through the next four-year cycle to Pyeongchang in South Korea. But the beginning of an Olympic quad provides a refreshing chance to review everything. We can shake the things that didn't work and emphasise those bits that did. I have always expected a lot from myself and this year is no different. I want to slide faster than I ever have before, be a better athlete and to try and win more gold medals. I am also the one to beat as the returning Olympic champion. My new nickname among my teammates is "OC" - a new experience for me! However, a less than perfect start to this year's pre-season training did put me out of step. It's always nice to experience a "first" - except when it's the first time you fall off the sled. It was in pre-season training in Konigssee, Germany, a few weeks ago. I had steered through the three large oscillations in the Kreisel corner and made it through the chicane of two extremely steep-sided corners. Before I knew it, I was thrown off the sled sliding around a huge left-hander with the sled on top of me. Every run, whether in training or competition, I stand at the start block with the same questions running through my mind: "Why am I doing this? Will I remember all of the steers? Will I crash?" I had never crashed the sled before so that one is usually ticked off. I realised in that split second that complacency had played a part - I had never crashed before so didn't think I had to worry about it. I got back on to the sled by the next corner and continued down the track to the outrun where I was met by two of my team-mates to check that I was OK, which luckily I was. Having grown up on a farm riding horses I knew the importance of "getting straight back on the horse". After my flip I was nervous about it all, but I had to show the track who was boss. I was eager to get back sliding the next day and rewrite my memory. The worst thing is to leave a track with bad emotions and memories because the next time you'll be there it will be near on impossible to perform. What a lesson - I won't let my concentration dip again that's for sure. After that rocky start, I am back to sliding well and I am in great physical shape. I've got all my track notes ready to take with me to Lake Placid and Calgary for the first two World Cup races. But more importantly, I have all my Christmas presents sorted and wrapped back home.